Refurbish - Oak House Design Co. I just realized my husband, Greg, has two weeks off work as of Monday. This conjures up in my mind thoughts of "all free!" days to work on my projects. I mentioned this to him. Of course he's probably thinking of just "all free!" days no projects, just rest. He deserves it. We'll see how much gets accomplished. I will show and tell you about a few of my projects. 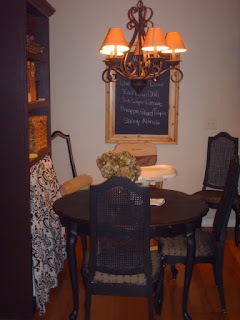 The biggest one is this dining table set that I found on craigslist. This is a picture of it in it's current location in my kitchen. I got it for $60 on craigslist. 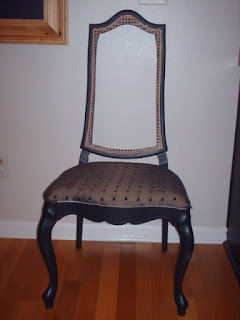 It's painted black, and has the cane back chairs that I love. I need to repair the chairs, recover the seats and repaint the entire set. I purchased the materials to recane the seat backs. 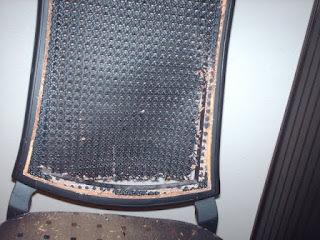 This is a picture of one of the damaged chairs. This is a close-up of the damage. 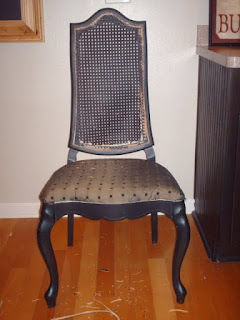 I went online for instructions for recaning a chair and was able to remove the old cane and spline. If you need a book about recaning a chair or supplies, see below. So this is a picture with the cane and spline removed. I have since started the recaning, it has proved to be a little difficult. When I get the new caning in I will let you see, but for now this is where I am. I must say though, I love the shape of these chairs. They have a beautiful silhouette. I can't wait until they are refinished! I'll tell you more about my home decor plans in a later post. I have to upload some pictures. I hope to have them for you soon.